TJ Formal Dress Blog: Just say "NO" to Knock-Off Sites! Chinese counterfeit sites are running rampant online. These sites steal images from US manufacturers and try to re-create the dress designs. Don't be fooled - they can't and the dresses end up cheap quality, and most look nothing like the original design. 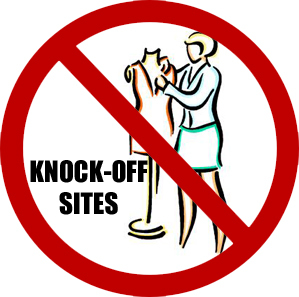 These sites are taken down and go out of business on a random and regular basis (when they get caught! ), and they then can't ship out their cheap dresses. Which means...if you order from them, you'll be without a dress and without your money. Don't take that chance! Watch this very informative video from Good Morning America about buying knock-off (cheap imitation) dresses from Chinese sites. Very Important! You will not get a designer dress unless you buy from an authorized dealer for the designer. These knock-off sites can duplicate the designer labels as well as the dress but the quality and style will not be exactly the same ... you'll get what you paid for, or may not get anything at all. Buyer beware! - especially for your life's special occasions!